"There's a tale told somewhere south of Burma. The tale tells of a man…" XLrator Media has debuted an official trailer for an action movie titled Savage Dog, which looks like it's straight out of the 90s as an action movie mixing guns and martial arts and a ridiculous revenge plot and so much more. Scott Adkins stars as a former champion boxer stuck in a prison in Indochina in the late 1950s. When he is released, the people running the jail don't want him to leave and so he must figure out a way to get home. The full cast includes Marko Zaror, Juju Chan, Cung Le, Vladimir Kulich, Charles Fathy, Matthew Marsden, Sheena Chou, and the incomparable Keith David. I really don't know how to describe this, it has some cool action but it seriously looks like this was made 30 years ago and kept in a vault until now. Check it out. Indochina, 1959. A Wild West town controlled by the criminal class: Vietnamese warlords and European war criminals. The worst prison in the land, it is here that a European, former-champion boxer Martin Tilman (Scott Adkins) has made a name for himself fighting tournaments. When Tilman is due for release, he just wants to return home, but the corrupt forces running the jail will do everything in their power to keep him locked down. When all that Tilman holds dear is taken away in a vicious act of violence, he is forced to confront the five men responsible and take his revenge. 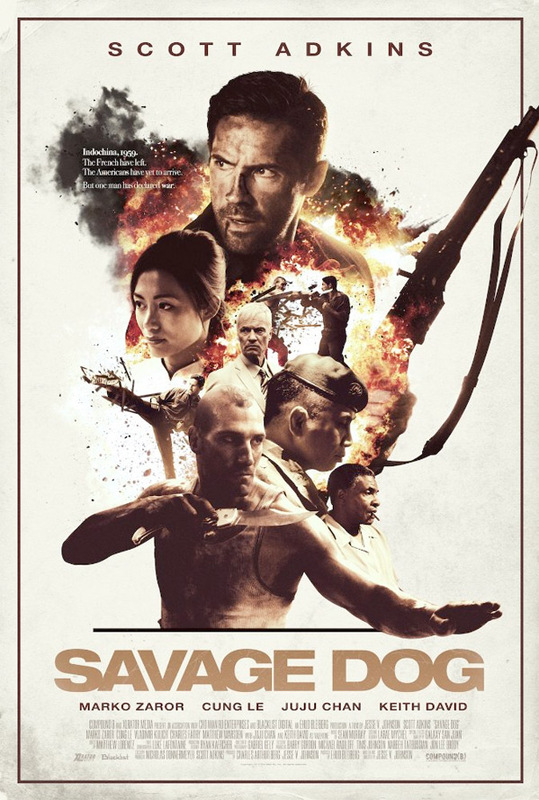 Savage Dog is written and directed by English stuntman-turned-filmmaker Jesse V. Johnson, of the action films The Honorable, Pit Fighter, The Last Sentinel, Alien Agent, The Fifth Commandment, The Hitmen Diaries: Charlie Valentine, Green Street Hooligans 2, The Butcher, and The Package previously. This already hit DVD in Europe this year. XLrator will release Savage Dog in select theaters + on VOD starting August 4th this summer. Interested?